Monday Must Have - On a Saturday... | Does my bum look 40 in this? ...because it's too good to leave till Monday. First up - this probably isn't going to everyone's cup of tea but it's the favourite outfit I have worn in a long time. You know when you put something on and it just appeals. This. This works for me. It's the perfect outfit. I've tried to summise why but I can't - I just adore it. So there. I wore it last night for a dinner party and I shall be wearing again today. So the skirt I have had on the blog before - I picked it as part of my paid partnership with M&S and I knew it would be a good 'un. Interestingly, I've just read through the reviews and people criticise the fact the fabric is too heavy. The heavy, amazing quality, means it hangs beautifully, looks a gazillion time more expensive than the price, fabric. Go figure. 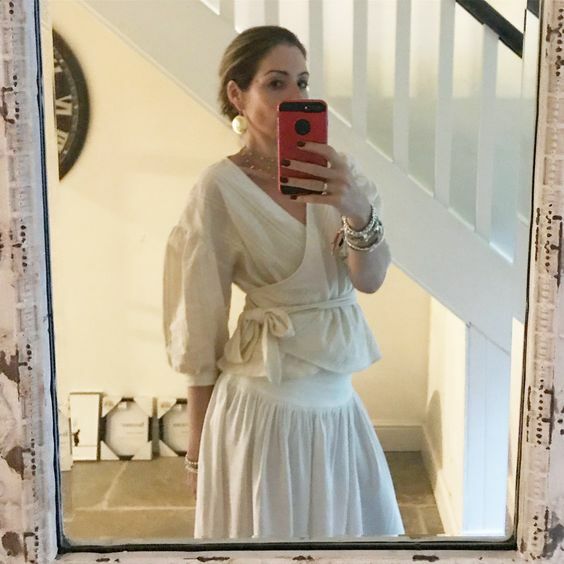 But put it with this absolute bargain of a blouse from Zara and I think you have an outfit that totally belies it's high street price tag. THIS is what I love about fashion. Being able to scavenge gems from the high street and put them together to create your very own looks that work for YOU. Yes, it would be lovely to be able to peruse Net A Porter, Matches and My Theresa and buy whatever takes your fancy. But you get a much greater thrill from curating looks yourself. IGNORE the fact that I should have straightened the belt out. It was all going so well...! Believe me when I say it's fabulous. As you can see - the decoration is all guns blazing in the hallway... not. A work in progress. You can also talkies of the outfit over on Instastories. I wore it with my tan Zara boots and I absolutely love love LOVED it. RIGHT - Eurovision calls. Have a fabulous Saturday night everyone!